Qxtender runs Plugins which perform specific tasks primarily for QuickBooks® users. (some Plugins do not require Quickbooks to perform their function -- see Plugin pages for more information). Plugins available are listed below. Each Plugin is installable as a full-featured 60-day trial (except where noted). Information on licensing and sending payment can be found on the "Pricing & Orders" page on this site, and on the "about box" of Qxtender. Oct 25, 2018: Qxtender 3.40 released. QB 2019 and Enterprise 19.0 supported . Run Qxtender's Online Update utility to get this update. 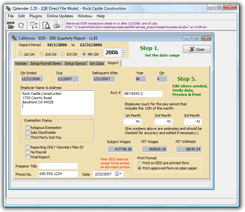 Qxtender and Plugins are 32-bit applications (as is most current software). However, they can be installed and run normally on both 32-bit and 64-bit versions of Windows. Contacts Exporter This plugin extracts extended Contact information from Customers and Vendors in QuickBooks 2013 and later, displays the information, and allows exporting to a standard comma-separated or tab-delimited file for use with Excel®, mailing applications, etc. Leads Exporter This plugin extracts information from Leads records in QuickBooks 2013 and later, displays the information, and allows exporting to a standard CSV (comma-separated value) file for use with Excel, mailing applications, etc. ShipTo Address Exporter This plugin extracts ShipTo address information from customer records and transactions in QuickBooks, displays the information, and allows exporting to a standard CSV (comma-separated value) file for use with Excel, mailing applications, etc. CA - EDD - DE542 Contractors Report Produces the information necessary to file California Employment Development Department's DE542 Contractors Report. Prints an approved form on plain paper. CA - EDD - DE-9/9C Quarterly Report Produces the information necessary to file California Employment Development Department's DE-9 quarterly report, including DE-9C continuation pages. Prints an approved form on plain paper (or optionally on preprinted form). IRS - 941 Schedule B - Quarterly Report Produces the information necessary to file the IRS 941 Schedule B quarterly report. Prints an approved form on plain paper. NY - NYS45 - Quarterly Report Produces the information necessary to file the New York State Tax Department NYS-45 quarterly report, including NYS-45-ATT pages if necessary. Prints an approved form on plain paper. Also produces a wage reporting file suitable for e-filing. TX - TWC - Quarterly Report Produces the information necessary to file the Texas Workforce Commission quarterly report (C-3/C-4). Prints an approved form on plain paper (or optionally on preprinted form). Also produces an ICESA file suitable for e-filing.